Snowman Soup anyone? Don’t mind if I do. This holiday season; give your friends and family edible gifts that they’ll actually devour. Who can resist hot chocolate that looks like a wintery snowman? Not me, that’s for sure! Snowman Soup in a jar. Edible gifts can be adorable and easy to make! Snowman soup is a creative edible gift disguised as an adorable snowman. This snowman soup recipe is a holiday medley filled with hot chocolate mix, a mini candy cane, mini marshmallows, and Ghirardelli peppermint bark squares. All of these goodies are packed in a clear mason jar with a lid and handle. It’s also topped with a black ribbon top hat and a holiday gift tag! Are you feeling an overflow of cuteness right now? Plus, with the help of a bit of bubble wrap, you can easily package these food gifts to send in the mail. These edible gifts are great for the classroom, as stocking stuffers and to melt any frozen hearts this holiday season! 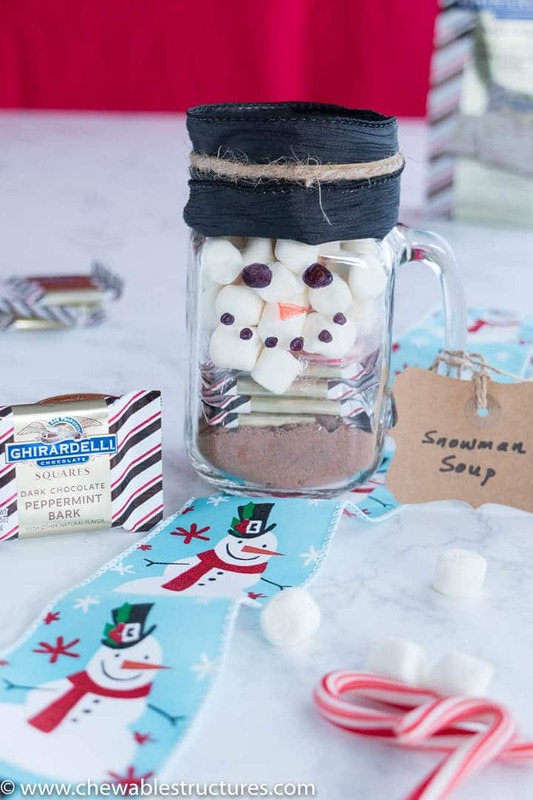 Take a peek inside snowman soup in a jar. Add the different layers in this order: hot chocolate mix, Ghirardelli peppermint bark squares, candy canes, and mini marshmallows. To make the snowman face (eyes, nose and smile) visible on the mason jar, it helps to have a white background (mini marshmallows). 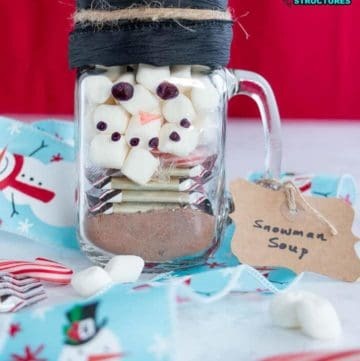 Draw the snowman’s facial features on the jar first, and then you can see where the marshmallows need to go. Try to draw the facial features on the top third of the jar; otherwise you will just have a jar of marshmallows. Although, that doesn’t sound bad either! I wandered the halls of Michael’s craft store with the vision of the snowman’s hat stuck in my mind. 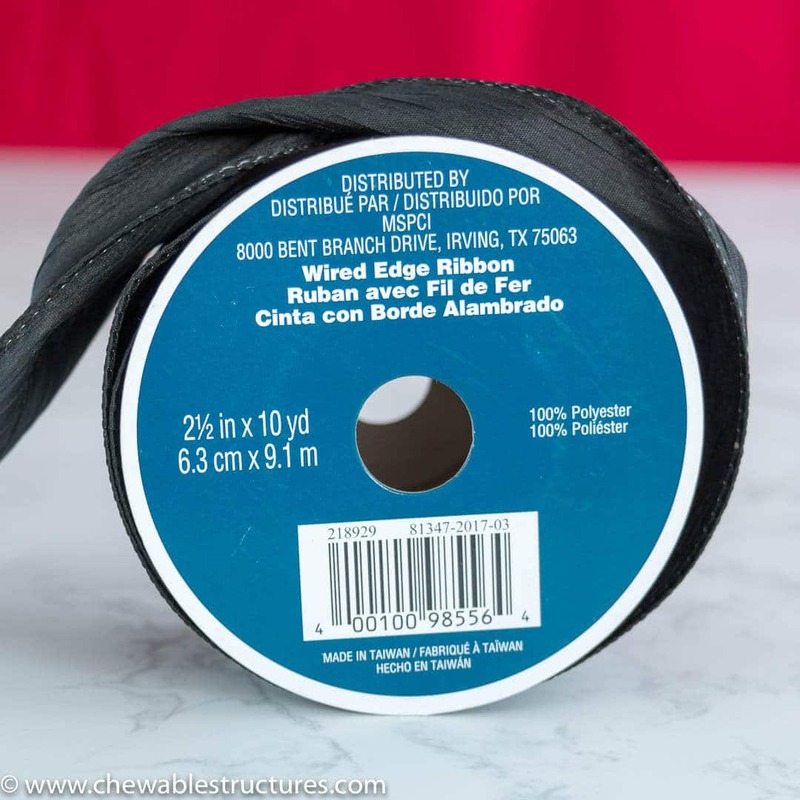 When I stumbled upon black ribbon with wired edges, I finally found a solution. To help shape the snowman’s top hat, it’s best to use ribbon with a wired edge. Since thin wire is stitched into both edges of the wire, you can pinch the edges of the ribbon and it’ll stay in place. Try to find a ribbon that’s at least 2.5-inch wide, then you can fold the lower edge of the ribbon and still cover the lid. Plus, the snowman’s top hat usually has a rim. In the below image, you can see how strong the ribbon is because it’s standing vertically on the table. I searched every aisle of Michaels crafts store until I found the best top hat for my snowman soup… this wire edged ribbon is perfect! There’s a thin wire stitched into both sides of this ribbon. It hold it’s shape really well and it’s so sturdy that it can stand up vertically. Tape will not keep it together. I tried. Using a regular old rubber band nicely secures the ribbon in place. For decorative purposes, use kitchen twine to cover up the rubber band. Ghirardelli peppermint bark squares are perfect in this snowman soup recipe. I love a hint of peppermint during the holidays! What Goes In Snowman Soup? How Long Does Snowman Soup Last? Check the best before date on your hot chocolate, marshmallows, candy canes, and Ghirardelli peppermint bark squares. The earliest before date of those items is how long your snowman soup will last. Storing your snowman soup recipe in a mason jar with a lid also helps prolong its life. I’m also keeping the candy canes and Ghirardelli peppermint bark squares in their original packaging. How To Make Snowman Soup Labels? I kept the snowman soup labels simple. I got gift tags from Michaels craft store and wrote “Snowman Soup” on them with a black permanent marker. Then, I tied the labels to the mason jar’s handle using kitchen twine. Now, I know there are fancy snowman soup labels out there, but I like that these edible gifts can be made in under 10 minutes. Saving time during the holidays is a key way to survive the holiday madness! If you have a few minutes to spare, you can always make a print out of how to make the hot chocolate (ie. the snowman soup). I purposely didn’t include snowman soup recipe instructions because it depends on the hot chocolate mix that you use. How To Ship Edible Gifts? Find a box that will support the weight and size of the snowman soup and all of the packaging. It’s best to smother the snowman soup mason jars in bubble wrap and label the package “FRAGILE.” Here’s a helpful guide by the kitchn on The Best Way To Mail Food Gifts. How To Wrap Edible Gifts? If you’re giving this snowman soup as an edible gift in person, then I think it’s best to give it as is. The decorated mason jar has a holiday wow factor that you don’t want to hide in a bag. Let the cuteness shine! Snowman Soup anyone? This holiday season; give your friends and family edible gifts that they’ll actually devour. It only takes 10 minutes to make. Snowman soup is a creative edible gift disguised as an adorable snowman. This snowman soup recipe is a holiday medley filled with hot chocolate mix, a mini candy cane, mini marshmallows, and Ghirardelli peppermint bark squares. These edible gifts are great for the classroom, as stocking stuffers and to melt any frozen hearts this holiday season! 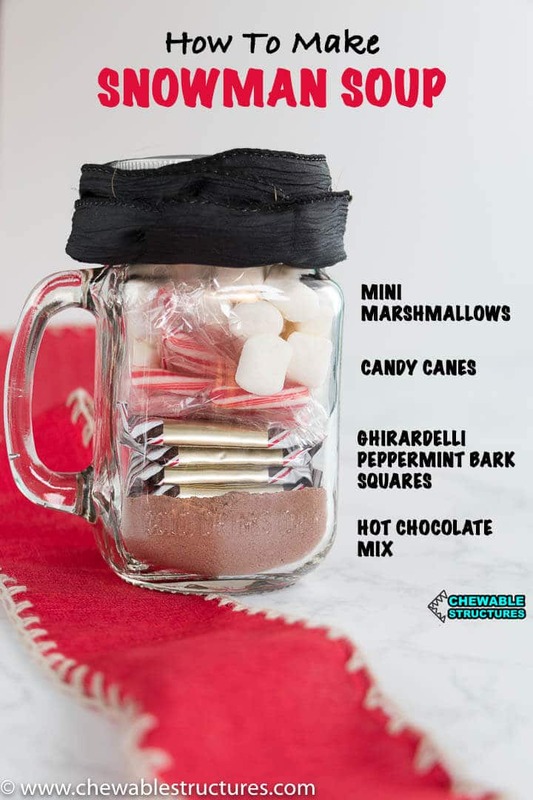 Fill the mason jar in this order: hot chocolate mix, Ghirardelli peppermint bark squares, mini candy canes and the mini marshmallows. Put the lid on the mason jar. Fold the bottom edge of the ribbon upward so it looks like a folded hat. Write “Snowman Soup” on the label and, using kitchen twine, tie the label to the handle of the mason jar. Tip 1: Draw The Snowman Face. Then Stuff The Mason Jar To make the snowman face (eyes, nose and smile) visible on the mason jar, it helps to have a white background (mini marshmallows). 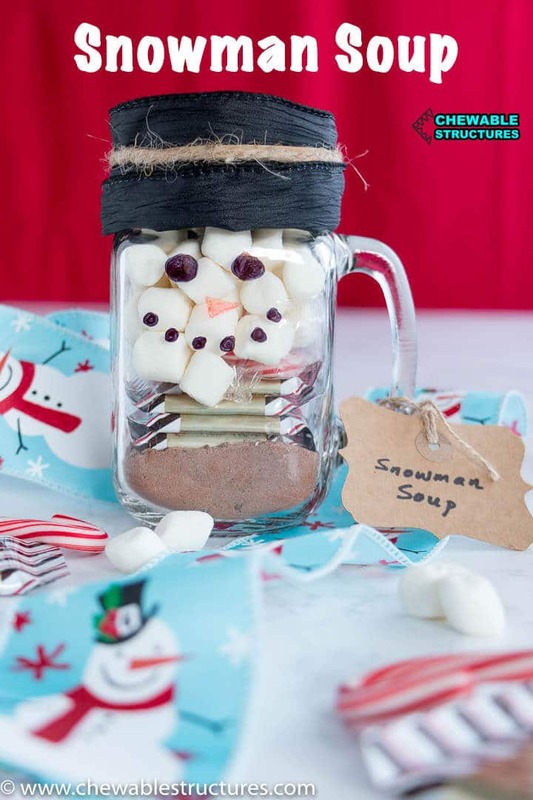 Draw the snowman’s facial features on the jar first, and then you can see where the marshmallows need to go. Try to draw the facial features on the top third of the jar; otherwise you will just have a jar of marshmallows. Although, that doesn’t sound bad either! Tip 2: Find Wired Edge Ribbon I wandered the halls of Michael’s craft store with the vision of the snowman’s hat stuck in my mind. 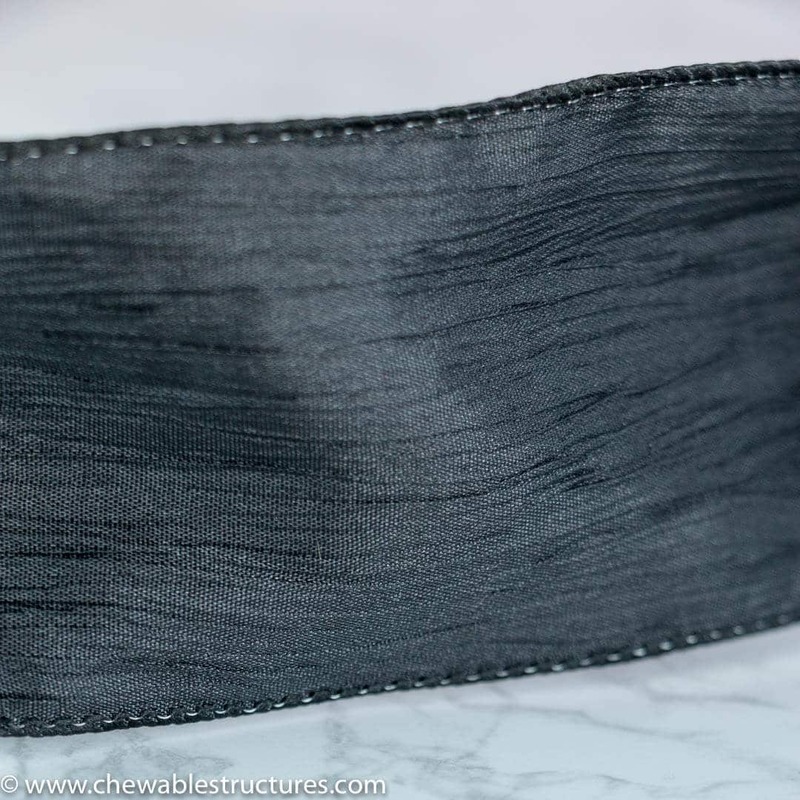 When I stumbled upon black ribbon with wired edges, I finally found a solution. To help shape the snowman’s top hat, it’s best to use ribbon with a wired edge. Since thin wire is stitched into both edges of the wire, you can pinch the edges of the ribbon and it’ll stay in place. Try to find a ribbon that’s at least 2.5-inch wide, then you can fold the lower edge of the ribbon and still cover the lid. Plus, the snowman’s top hat usually has a rim. In the below image, you can see how strong the ribbon is because it’s standing vertically on the table. Tip 3: Keep It Together! Use a Rubber Band Tape will not keep it together. I tried. Using a regular old rubber band nicely secures the ribbon in place. For decorative purposes, use kitchen twine to cover up the rubber band. Theresa! These are so adorable and I love how easy the directions are! Im thinking I’ll be the coolest auntie ever having my niece over to make a few of them for her friends for Christmas! Thanks michele! I’m pretty sure you are already a super cool Aunt! I love simple and fun recipes too. The snowman’s top hat is my fave part!